If the reason for climbing Mt. Everest is that it's hard to do, why does everyone go up the easy side? We have for some years known that this mountain is higher than any other hitherto measured in India, and most probably it is the highest in the whole world. I was taught by my respected chief and predecessor, Colonel Geo. Everest, to assign to every geographical object its true local or native appellation. I have always scrupulously adhered to this rule, as I have in fact to all other principles laid down by that eminent graduist. 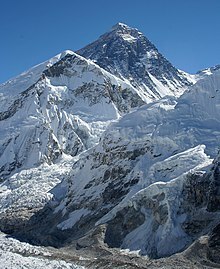 But here is a mountain, most probably the highest in the world, without any local name that we can discover, or whose native appellation, if it have any, will not very likely be ascertained before we are allowed to penetrate into Nepal and to approach close to this stupendous snowy mass. In the mean time the privilege, as well as the duty, devolves on me to assign to this lofty pinnacle of our globe, a name whereby it may be known among geographers and become a household word among civilized nations. In virtue of this privilege, in testimony of my affectionate respect for a revered chief, in conformity with what I believe to be the wish of all the Members of the scientific department, over which I have the honour to preside, and to perpetuate the memory of that illustrious master of accurate geographical research, I have determined to name this noble peak of the Himalayas "Mont Everest." You will perceive the gist of the question is not whether the mountain should be called Mount Everest or by its true native name (which is a principle not disputed by any one), but whether it can be called Deodanga without risk of error, in the absence of satisfactory proof that this is really its native name. A symmetrical, beautiful snow cone summit.